Actually it never would have occurred to me to try this, except for this photo of Peg's, from this post. It was slow going to get a clean shed, but I just couldn't stop weaving. 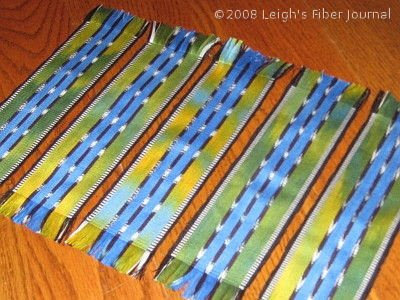 My painted warp colors were more defined at the ends of the warp, and more blended in the middle. I just didn't want to lose the color in that section of warp! The project details for these are in this post. The only thing I can add is to say that there was very, very little draw-in and take-up in this project. I lost one to two eights of an inch in length, but that's it. Even though these are woven with 20/2s cotton, it is interesting how heavy the fabric is as a warp-faced plain weave. Quite suitable for bookmarks. And other things, though I'm still trying to figure out what. 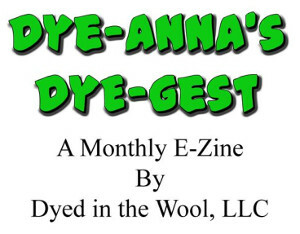 I need to get different project on the loom, but I plan to do more warp painting and ikat dyeing. These are definitely in my near weaving future. - the weft had been finer than the warp. - or the warp had been wider. So don't let that fool you if you should decide to make a wider project. All I can say is pretty, pretty, pretty. I just want to weave like you!!! Very nice. I enjoy watching your projects. Ah, thanks for that Valerie. I will definitely keep that in mind. Jewel and Mim, I appreciate your kind compliments! I think it is the devil himself who is responsible for the idea of painted warps! The things painted warps make you do! Yes, I too find it nearly impossible to stop weaving when I have one on the loom. Beautiful work. More to come? Painted warps and tied weaves.....??? Love love LOVE painted warps, and the magic results that happen as they're woven up. The combination with the black and white ikat is just stunning. Even though the green is not one of your favorite shades, it really added some lustre to the overall look. Those are GORGEOUS!! Really stunning. How did you finish off the ends? What can I say that everyone else hasn't said? Great job!!!!!! I love the handpaited warp. Each bookmarker is the same but different. The colors are lovely! How many did you get? Oh Peg, you've read my mind! Painted warps with tied weave, YES! Thank you Jane. Initially I wasn't sure I'd care for the black and white the way it is, and probably wouldn't have planned it this way myself. Following the workshop instructions to the letter was an excellent exercise for me though. Sue, the ends were finished with one of Kaz's tricks.... at the beginning of the bookmark, the weft end replaces the 2nd weft shot, which serves to lock it in. 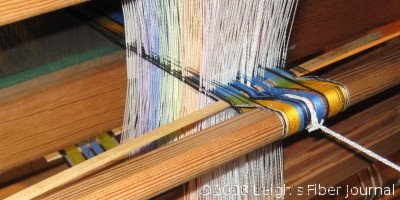 To finish, a fine crochet hook is laid in the warp instead of the 2nd to the last shot. After the last shot is thrown, the weft is cut and pulled back through the web with the crochet hook. This locks it in at the other end and all that's left is to cut the fringe once the bookmarks are off the loom. Thanks Barb, it was a lot of fun! Laritza, I managed 10, just in time for Christmas gifts. Other possible uses for a strong bookmark-width fabric. These are fabulous Leigh. All your posts on your progession of the workshop really inspire me. Are you going to use the red colourway too? I'm thrilled that you got so much out of the workshop. Thank you. Kaz, your the one who should be thanked! The workshop was a lot of fun and I'm very inspired by what I learned. I am definitely going to use the red colorway, though I haven't decided how yet. I'm definitely going to do a lot more warp dyeing in the future!